See What Happens on the Next Few Episodes of HBO’s ‘Boardwalk Empire’!!! From Terence Winter (Emmy®-winning writer on HBO’s The Sopranos) and Oscar®-winning director Martin Scorsese, Boardwalk Empire is set in Atlantic City in 1920 at the dawn of Prohibition. The series chronicles the life and times of Enoch Nucky Thompson (Steve Buscemi), the city treasurer whose double role as politician and bootlegger makes him the city’s undisputed czar at a time when illegal alcohol has opened up highly lucrative opportunities for rumrunners and distributors. In a city defined by notorious backroom politics and vicious power struggles, Nucky must contend with ambitious underlings, relentless Feds, rival gangsters — including Arnold Rothstein, Lucky Luciano and Al Capone — and his own appetite for women, profits, and power. While Nucky (Steve Buscemi) enlists heavyweight champ Jack Dempsey (Devin Harjes) to promote the wireless broadcast of his upcoming fight, Jimmy (Michael Pitt) faces a decision that could shape the future of Atlantic City. Margaret (Kelly Macdonald) travels to Brooklyn for a bittersweet reunion with the family she left behind in Ireland. Irked by the arrival of Daugherty’s (Christopher McDonald) new federal prosecutor, Esther Randolph (Julianne Nicholson), Nelson (Michael Shannon) weighs his options as his personal and professional problems converge. Badly in need of support, Lucy (Paz de la Huerta) visits an old flame for a handout. Owen (Charlie Cox) settles one score, and sets his sights on a new conquest. Written by Howard Korder & Steve Kornacki & Bathsheba Doran; directed by Allen Coulter. In the wake of a personal loss, Nucky solicits advice on his political situation from Arnold Rothstein (Michael Stuhlbarg), while Eli (Shea Whigham) remains suspicious of his brother’s actions. Nucky finds himself in the unfamiliar position of showing gratitude toward a federal agent; Angela (Aleksa Palladino) meets a new friend at the beach, and eavesdrops on her husband’s treachery; Nelson gets a nanny; Nucky approaches Owen with an overseas proposition; Jimmy flexes his muscles, at Mickey Doyle’s (Paul Sparks) expense. Arriving in Belfast, Nucky and Owen meet with IRA leaders with a barter proposition. Meanwhile, in Atlantic City, Jimmy and his partners broker a deal with George Remus (Glenn Fleshler) for his “medicinal” alcohol before taking a break to see/hear the Dempsey fight. Margaret frets when Emily’s (Josie and Lucy Gallina) illness takes a turn for the worse; Dunn Purnsley (Erik LaRay Harvey) orchestrates a worker’s strike at the Ritz; Waxey Gordon (Nick Sandow) takes action against Manny Horvitz (William Forsythe) in Philadelphia; Randolph and Clifford Lathrop (Curt Bouril) grill Halloran about Nucky’s past. Written by Steve Kornacki; directed by Brad Anderson. 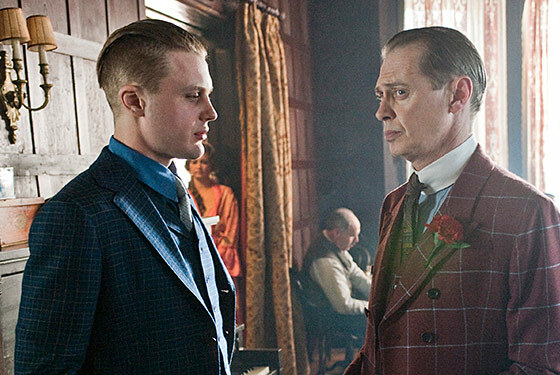 Undercut by Nucky, who has a new source for alcohol, Jimmy and his partners look to cultivate a new revenue stream in Atlantic City. With the peak tourist season approaching, the Commodore’s (Dabney Coleman) crew faces a choice in dealing with the city’s striking workers: negotiate or fight back. Fearing that sin has led to misfortune, Margaret approaches Father Brennan (Michael Cumpsty) with an “act of devotion.” Nucky gets a new lawyer; Van Alden faces an uncertain future; Manny Horvitz takes exception to a debt payment. Written by Dave Flebotte; directed by Jeremy Podeswa. This entry was posted on Friday, October 21st, 2011 at 2:39 pm	and is filed under News. You can follow any responses to this entry through the RSS 2.0 feed. You can skip to the end and leave a response. Pinging is currently not allowed. « See What Happens on the Next Few Episodes of HBO’s ‘Bored To Death’!! !